Home › Frugal Cookers – Cooking Methods & Systems Compared › Pressure Cookers Guide – Which Pressure Cooker to Buy? 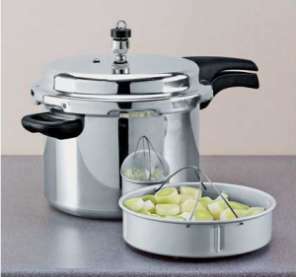 Pressure Cookers Guide – Which Pressure Cooker to Buy? We’ve had a pressure cooker for 30 years and it still works like new. We’ve replaced seals and valves along the way, of course, but we certainly get our money’s worth from it. Was it worth buying? Yes! And here’s why. Pressure cooking isn’t new, the first pressure cooker was invented by Denis Papin, a French mathematician in 1679! Early pressure cookers were difficult to use and had a tendency to explode. This was due to lack of safety valves and metal working not being up to constructing pressure vessels. Early steam engines often went bang as well! After a few hundred years technology caught up with the concept. By the 1950s pressure cookers were affordable, simple and easy to use and above all safe. The theory of pressure cooking is quite simple. Water boils at 100 degrees centigrade at sea level but the boiling point rises as pressure increases and lowers as it decreases. That is why mountaineers can’t get a decent cup of tea. The water boils at too low a temperature to brew the tea properly at high altitude with low pressure. Pressure cookers increase the pressure inside which raises the boiling point so you cook the food at a higher temperature. This means water boils at 120°C rather than 100°C which means the steam is hotter so food cooks far more quickly. As you should know, cooking with the lid on reduces heat loss dramatically and therefore saves energy. Once your pressure cooker reaches pressure and temperature, you can turn the heat down to minimum and it will happily carry on cooking. Pressure cookers really come into their own when bulk cooking. We eat a lot of pulses and dried pulses can take a long time to cook. Using the pressure cooker reduces the time taken dramatically, saving time, money and the kitchen steaming up. We tend bulk cook these and store ready-cooked beans in the freezer. This makes them just as convenient to use as canned beans, which are much more expensive. When we harvest our carrots, often there are damaged ones that won’t store well and we love mashed carrots. So we’ll make a batch in the pressure cooker and freeze them. Then it’s just a matter of taking one pack out of the freezer to go with Sunday lunch. Most root vegetables take a long time to cook conventionally but just five minutes or less in the pressure cooker. Most often they are used to cook ‘all-in-one’ meals like stews or casseroles and they retain vitamins because the vitamins that dissolve into the fluid are consumed as part of the meal. It’s almost a sin to waste the carcase of a chicken when you can use it to make your own stock, which will be a great base for soups and gravies. Normally you take the carcase, add an onion, carrot and some herbs then slowly simmer for a couple of hours. Making stock in the pressure cooker only takes 40 minutes! You can cook entire meals like a stew with a pressure cooker but we tend to just use ours where there is a clear benefit in saving time and energy. It’s a bit like those books on microwave cooking that tell you how to cook everything in there. For some things they’re excellent but for others, it’s a triumph of recipe writing over common sense. You might have heard that pressure cooking destroys vitamins in food. It seems logical, after all you’re cooking at a higher temperature. The truths is the opposite, pressure cooking actually retains more vitamins than boiling, steaming or most other cooking. Pressure cooked food is healthy food! Which Pressure Cooker to Get? There’s a number of different makes of pressure cooker on the market. For our money we made the right choice all those years ago when we bought a Prestige Hi-dome. Replacement gaskets and safety valves (these do need replacing eventually) are easily available and not to expensive. Buying other makes could find you stuck for a part in years to come. It’s a 6 litre cooker, as are many others, but the high lid means the pressure valve won’t block if the contents froth up. If that did happen, the safety valve would operate but it’s not what you want. It also makes it useful for pressure bottling. Microwave Ovens Guide – Which Oven is Best for You?